Eliminate awkward gaps in your flooring with a high-quality, sustainable bamboo reducer from Ambient Bamboo Floors. You can shop all of our bamboo reducers on this page. 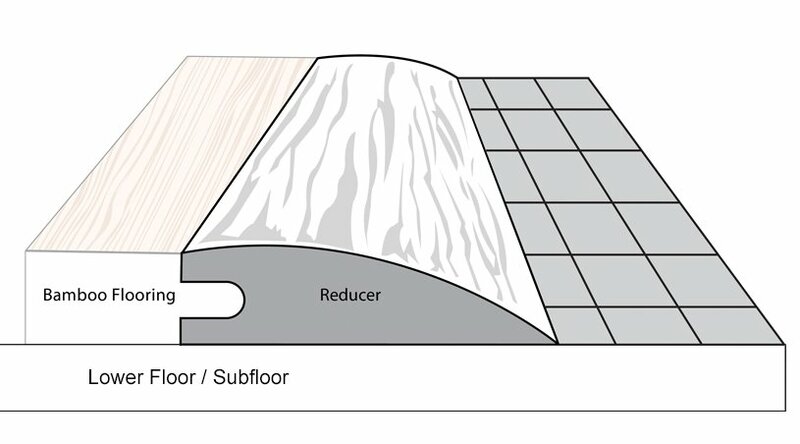 Bamboo reducers are used to transition from bamboo flooring to a lower surface (ground level), such as vinyl or short-pile carpet. Equally important in preserving the finished look of a room and the safety of anyone in it, bamboo reducers are an essential part of any renovation where transitioning between surfaces is a concern. It reduces tripping hazards by rounding out the square edge of the flooring so that it isn't exposed. 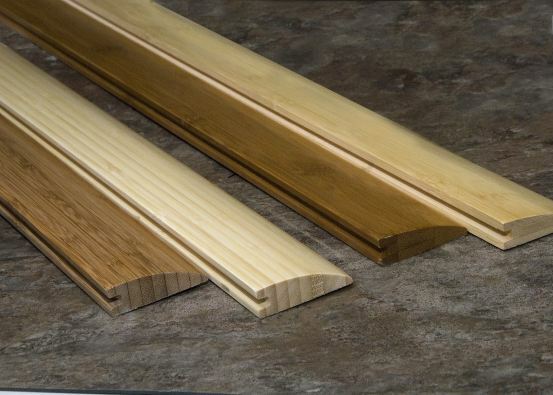 We offer floor reducers in classic (solid horizontal/vertical) and strand-woven bamboo. Classic bamboo reducers preserve the look and strength of traditional bamboo flooring and finishing products, whereas our strand-woven offerings mimic the distinctive grain of traditional hardwood and possess additional strength and durability. Our classic bamboo products come in natural (blonde) and carbonized (tan) colors. By upgrading to a strand-woven bamboo reducer, you add the choice of additional colors including chocolate, sangria, sienna and many more. Installing one of our bamboo reducers is simple. All our transition moldings can be glued into place using a non-water-based adhesive. We recommend against using nails, particularly when working with strand-woven products. After installation, the reducer can be held in place using blue carpenter's tape or weighted down while the adhesive dries completely. Always follow the manufacturer's instructions when using any flooring adhesive. Bamboo is an excellent choice for homeowners who are concerned about making responsible environmental choices. It also often offers greater value than traditional hardwoods, as well as better durability and easier installation. Bamboo can be less prone to warping - in fact, we offer a lifetime structural warranty on all our products! Our bamboo floor reducers are finished with our proprietary AccuSeal® Finish System, preserving the product's strength without obscuring the beauty of the wood. Pet- and family-friendly, our flooring has been independently tested to ensure it exceeds specifications laid out by the U.S. Occupational Safety and Health Administration (OSHA) and the European (E1) and California Air Resources Board (CARB). When you purchase bamboo reducers or flooring from us, you're making a choice that's healthy for your family and good for the environment. Contact us today for your free quote!